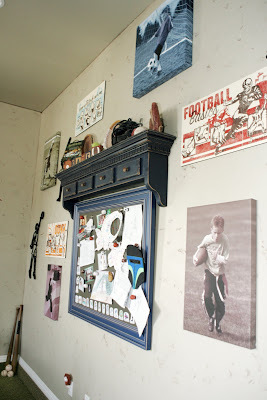 I also thought I'd give you a peek at another project he and I (mostly "I" on this one, though) have been working on his his room. 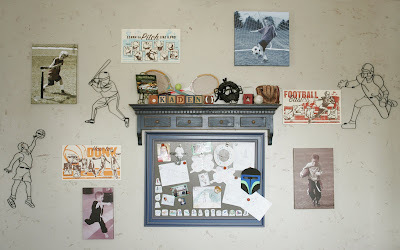 which we decided to make into a funky 3-D Sports Collage, featuring... HIM! Since I am in LOVE with those Gallery-Wrapped Canvases lately, we made a few from some of our favorite shots of him in action. He helped me choose which pics he liked best and what monotone-shade to make them into. We even got Dad involved, since he is the one who builds the frames and wraps the canvases for us... Thanks, Babe! You're a pro! 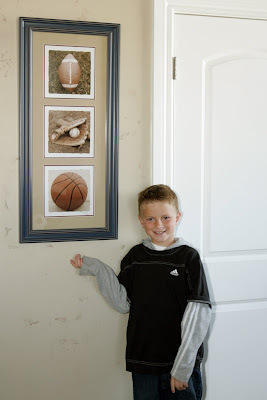 We just LOVE how this wall is turning out and plan to add to it and update it as he plays each different Season... something we can BOTH look forward to! so much fun!!! Very talented family! We have a few sport freaks at this house too! Look at this sports room! 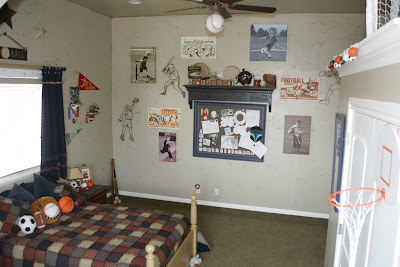 Troy will be there with his luggage right after he finishes his stay in Jane & Dusty's Red Sox room. Seriously, though. The artwork is amazing. 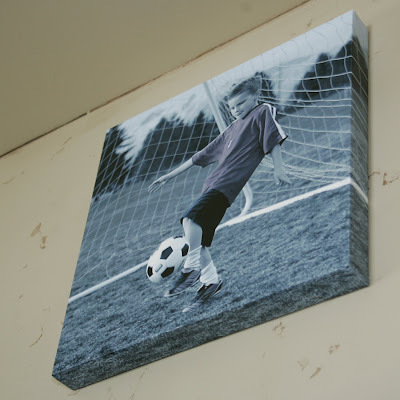 I loooove how the soccer net is stretched across the side of the frame. You make it look so easy but I imagine it must be difficult to get the canvas smooth and straight on those corners. What a fun bedroom!!!! I LOVE his wraps!!! I'm going to do some too, but I just can't figure out which ones!! I hate that part! I love all the different shades too! How cute! What a fun idea for you both. I bet he just loves being the "star" of his own little hall of fame wall.